Discussion in 'Ford' started by xcel, May 2, 2011. At idle, the 2011 Ford F-150 is using so little additional fuel to run A/C that at highway speeds, its fuel consumption and fuel economy delta with or without was so small to be almost undetectable. In other words, leave the windows up and run the A/C for maximum comfort and maximum fuel economy in the warmer summer months. While driving across the California desert with temps that reached 100 degrees F, we could switch A/C on and off again and saw no change to the trucks fuel consumption as it was hidden within the noise of the terrain following regimen. In our not-so-scientific study of the A/C use in the Fiesta, we were tailing the F-150 on the way to the ATL airport. For a 30-mile or so stretch, we ran the A/C and were driving between 55-65 MPH and the Fiesta got around 42 MPG per the onboard aFCD for the stretch. It appears the Fiesta's A/C made very little impact at cruising speeds as well. I imagine the city/surface stop/crawl would take much more of a hit. While passing just North of Birmingham, we came across but one of the many tornado touchdown sites in the state and all I can say is god speed to those that lost their lives in this one… It is one thing to see a natural disaster from the LCD and quite another to see it in person. You just cannot imagine the damage path from a screen in your living room. Using Google Maps and retracing our route, I found a "street view" of the station pictured above. I confirmed the correct route and location based on photos I have of the damage in the same area. Below is the before photo and above is the after photo. WOW! Just WOW! It sends shivers down my spine. 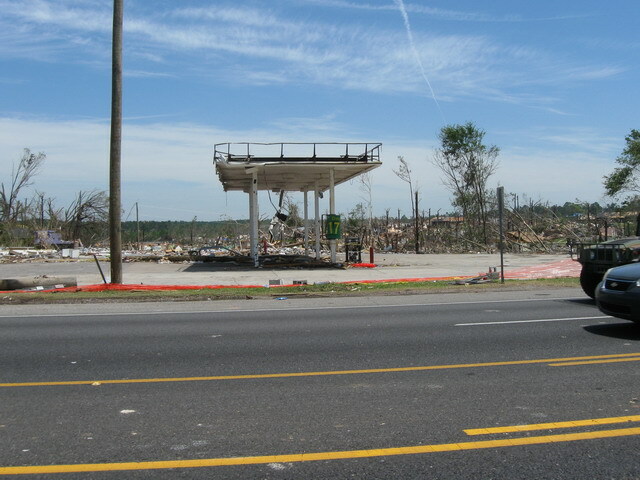 You can still see the green sign in the damage photo on the column in the structure still left. On the highway at a CC 60 mph I'm seeing a fair drop in mpg with a/c on. / as an aside, tailgate up on the long bed will drop mpg 1 mpg at 60 mph. // maybe Ford did some work on the air conditioner efficiency between '09 an '11 ... I don't know. But I do know from servicing air conditioners that you'll see a much higher pressure drop (high side to low side) and a corresponding higher load from the a/c compressor once the rpms come up from idle. /// BTW, I don't mean to come off as overly critical. I do appreciate all the info you provide on this website. I've learned a lot. And ... I'm a Ford fan myself. For more shivers (you can't see these things and not be affected), consider the photo here. Another Google street view, this is a small development with maybe 100 hi-ranch homes. The street just left of center goes away from the camera and then curves right (not shown in photo). But from this perspective, that street you see in the photo runs two blocks ahead and perpendicular into the property (up to the rear) of that gas station before turning. 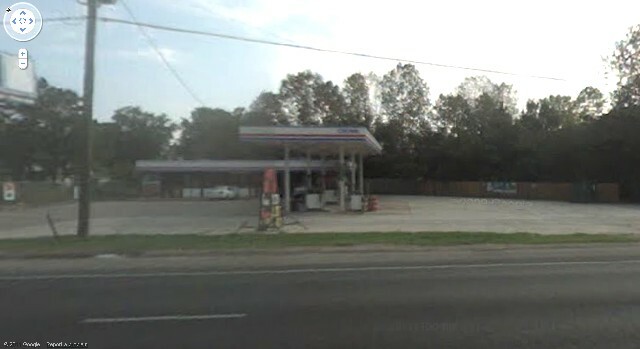 When you see the photo of the gas station with what looks like an empty field behind it, that empty field is where the homes pictured here once stood. I wonder if your "special edition" F150 had Ford's new variable displacement air conditioner installed? I can see no reference where it's listed as being on the F150 as of yet, but they have talked about it being new to the 2011 explorer. There is no mention of variable displacement a/c in any of the literature that I have for mine that I'm aware of. I'll doublecheck and see. All told, if you need a heavy LD hauler during the week and a semi fuel efficient ride when it comes to the really light duty tasks, little can match what the EcoBoost provides as demonstrated during the Challenge Drive. When on a X-Country trip with a 2011 Ford F-150 w/ EcoBoost and a 2011 Ford Fiesta and have too much time on your hands, this is what you do. It's funny they made the effort to change the tone. It would be easier to use the same in both vehicles, but they thought it worth the time to program a different pitch for each. Manly vs cute? It may actually be due to manufacturing tolerances? I've seen the same make and model vehicles with different blinker rates. I am seeing a lot of EcoBoosted F150's on the road now. I have 2 friends that are owners also. One is a motorcycle dealer and just bought a new 2011 Supercrew 4x4 F150. He said he couldn't pass the deal up. He got $6000 cash back from Ford. $6K pays for the EcoBoost upgrade! How is his fuel economy now that he has a few miles on it and its getting downright cold for the morning commute in particular? Just had to read this adventure all over again after overdosing on GM truck news..